Living in Boca Raton means you get the kind of romantic Florida beach living idealized from the mid-20th century onward in books, music and movies. But the city is more than its beaches, with its rapidly growing economic environment, A-rated public schools, five colleges, abundant public parks and spaces, and a vibrant art culture. There’s also a thriving tourism industry, with a plethora of resorts catering to travelers looking for golf, the beach or just an escape. Reasons to move to Boca and make a home are myriad. 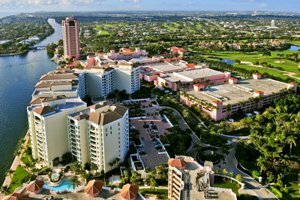 Here are a few reasons we think living in Boca Raton is a wise choice. Downtown Boca Raton is filed with restaurants and shops. Whatever your ideal arrangements are, from high-rise condos along stretches of sandy beach to gracious golf course-centered homes, to quaint mid-century single-family houses in Florida style, all can be found in Boca Raton across its 29.6 square miles. As an added bonus, Boca has a low tax rate, resulting in part from the highest assessed value in Palm Beach County. Boca Raton’s business climate has generated some 8,000 new jobs over the past five years. That includes a burgeoning tech industry and reputation as a solid tech startup hub. Other major employers, according to Mayor Haynie, include education (with 28 public and private K-12 schools, plus five colleges), Office Depot’s corporate office, Cancer Treatment Centers of America, Garda, ADP Payroll Services, IBM and Jarden Consumer as well as the insurance and medical industries and the city itself, with 17,000 employees. Boca Raton has some 46 parks, covering 16,000 acres of parkland and trail. Two continuous north-south trail routes connect the Tri Rail system to Florida Atlantic University, so that students living farther out can then bike from the train station safely. The city also has 4 miles of beautiful public beach, left in its natural state rather than commercialized. Boca Raton also has one of the only dog beaches in Palm Beach County for pet owners. 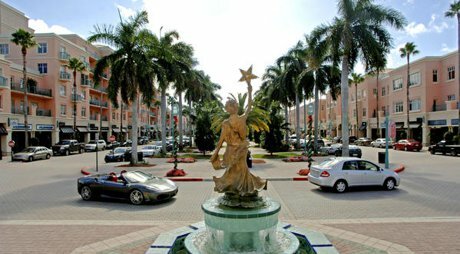 Built in a Mediterranean Revival style, Mizner Park serves as one of the focal points of the city for residents and tourists alike. The epic Town Centre Mall (mixed indoor and outdoor shopping), which includes Lord & Taylor, Tiffany & Co., Neiman Marcus and Macy’s, is the largest mall in the region. A vast mixed-use project, Mizner offers a diverse collection of things to explore. The Centre for the Arts at Mizner Park sits at the north end, along with an amphitheater and the Boca Raton Museum of Art. Speaking of those arts locales, Boca Raton’s Festival of the Arts, each March draws tourists from all over. An extraordinary celebration of the arts across the board, the festival offers up classical music, jazz, dance, film, writers and more. The goal is not only celebration, but sharing all aspects of the arts with all ages. Of course, the world flocks to Palm Beach County for golf and the chance to swim, boat or go snorkeling off the splendid beaches, but Boca also hosts the Allianz Championship golf tournament, which brings visitors in annually to see outstanding PGA Senior Tour players battle it out on the greens. Boca Raton’s institutions of higher education, particularly Florida Atlantic, also provide plenty of collegiate sports to cheer. The biggest new sports draw for the city is the Boca Raton Bowl, held at Florida Atlantic University’s stadium. The city recently signed a six-year contract with ESPN for coverage, with a playing date immediately before Christmas. “Last year, Marshall was one of the colleges playing, and their band actually went out and practiced on the beach,” Mayor Haynie says. Boca also has huge organized youth sports, including football, soccer, lacrosse and plenty of available facilities to make both youth and adult participation possible. Boca Raton’s dining options seem to be getting better every year. For those interested in keeping things fresh and local themselves, the farmers market runs each Saturday from October through May. The farm-to-fork Farmer’s Table at the Wyndham Hotel Boca Raton sets an example for local sourcing done well. Other favorites include Yard House, Max’s Grille in Mizner Park, Gluttonous Goat, Rebel House and more. A number of high-end chains also thrive in Boca, including Ruth’s Chris Steakhouse and Morton’s. The city is currently working with upscale chain Houston’s to plan a destination restaurant on the waterfront, according to Mayor Haynie.